It is a little unclear at this time when precisely this set of plans is dated, as different sheets show different fits. DMS-2 was commissioned as DD-119 Lamberton in August of 1918 and was reclassified as a DMS in late 1940, however the "SE" radar noted on sheet 4 was a short-lived set with production starting in 1942. Approximate dates are noted for each sheet. This sheet is more or less "as launched" and shows the main deck woth the original four torpedo launchers fitted, as well as the 5" gun behind the aft deckhouse. This was later moved on top of the aft deck house when she was modernized in 1921. 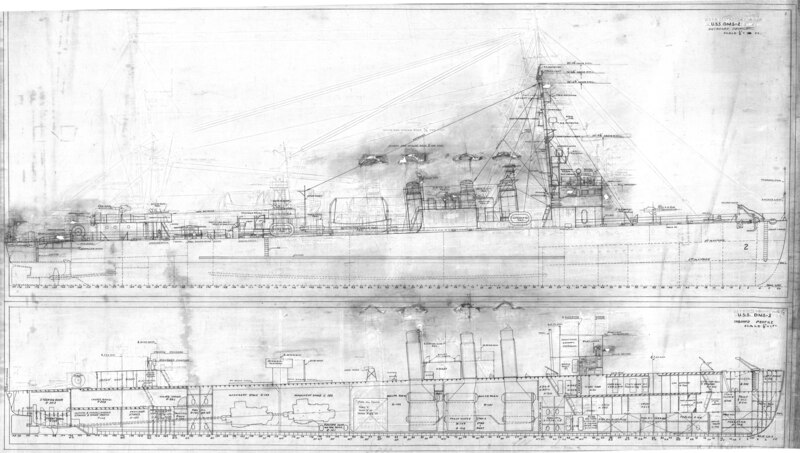 Typical among the converted FLush deck four-pipe destroyers was removal of boilers - in the DMS case the aft boiler was removed and the space used to add more fuel oil storage, as we see in the hold level plans. Ghosts of configurations past are visible in this image - note that all four stacks were lowered before the fourth stack was eliminated. Past masts and rigging are also visible.